Academic Games Leagues of America (AGLOA) is a non-profit organization dedicated to developing “Thinking Kids” of character, excellence, and integrity. 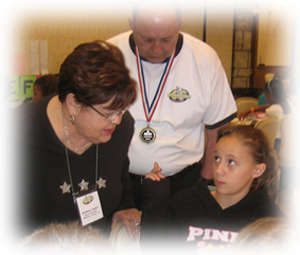 AGLOA provides a series of Academic Games competitions throughout the nation culminating in a National Championship Tournament in late April each year. Players receive recognition and rewards in the same way that sports champions are honored. AGLOA welcomes any student in grades 4 – 12 to join and play Academic Games. A student may play as an individual but most play in teams of five. Participants compete in one or more of six different Academic Games events. Players first learn to play at their schools, and compete against students from other schools in their area. Winners move up to Regional events and the National Tournament. What is Learned in an Academic Games Competition? Mathematics, language arts, and social studies are the core subjects for the various games. Players often learn and apply important concepts in these subjects before they are learned in school. Strategy, in addition to knowledge, is a key component in each of the six Academic Games competitions. It is not enough to know the subject matter (though the more a player knows, the better the player will be). Players must also develop courage, character, and poise in applying their knowledge while competing against opponents. You may view the description of each Academic Game to see What Players Learn, How Do You Play, and How Do I Get the Materials. Three of the competitions require players to use actual board games made by the company WFFand Proof. In these competitions, a player competes against two other participants. The complexity of the games is shaped by moves that players make. Players must make plays that outwit their opponents at the highest Mathematics and Language levels. The basic rules are the same at all Divisions, but the knowledge level required at the High School level is considerably more difficult than for the Elementary players. These events require players to respond to questions or examples that are read. Players’ knowledge is tested but so is their confidence level. Students must develop strategies involving WHEN to answer, HOW MUCH to wager, or how BOLDLY to answer. Some players excel at the head to head competitions, others are better at the question responses. National Sweepstakes champion players and teams do well in both. When was the first Academic Games competition? The first Academic Games National Tournament took place in the spring of 1966. Organized local leagues began in the 1966-67 school year. Each year since that time, players and coaches from various locations in the nation have congregated to compete against each other. Academic Games Leagues of America, Inc. (AGLOA) was incorporated in 1992 and has hosted a National Tournament each year since then. Over 20,000 players have competed nationally since 1966. Over 100,000 players have participated in local Academic Games matches. The alumni list of former Academic Games players and champions includes major business leaders, outstanding educators, and professionals of all types. Our alumni have grown to become leaders in their communities and their work lives.